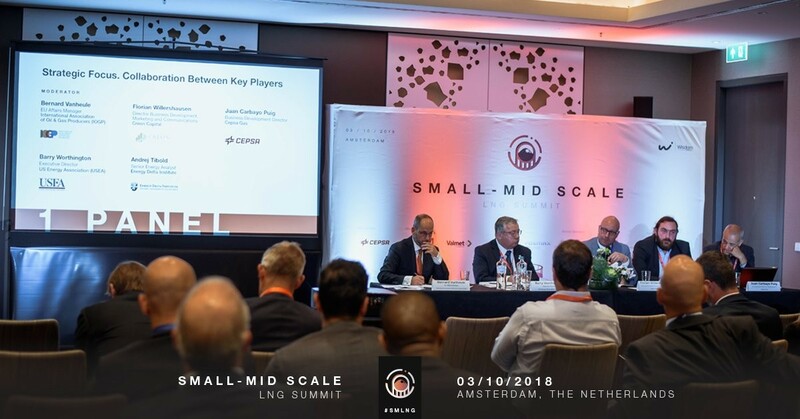 The 60 participants in the Wisdom Small and Mid-Scale LNG Conference in Amsterdam agreed on one thing: The demand for Liquefied Natural Gas (LNG) will grow enormously over the next 15-20 years. Royal Dutch Shell had concrete forecasts for this: in 2035, the world could deliver 600 million tons of transportable liquefied gas per year, more than twice as much as in 2017, according to Shell’s LNG Outlook for 2018, which was introduced by Shell’s Senior Advisor Gas Strategy Wouter Koopman. From 2020 onwards, Shell expects a growing deficit in LNG: Although the gas market grows only one percent per year, the role of LNG as a resource for power plants or for the propulsion of ships is steadily increasing. “Gas is an easy subsitute to coal if we want to contribute to climate goals,” says Koopman. The additional volumes of liquefied petroleum gas, which manufacturers from Russia, the US and soon also from Canada on the market rinse, will not be able to keep pace with the growing demand, according to the expert. Florian Willershausen, Director Business Development, Marketing and Communications, participated in the strategy panel for Creon Capital. He pointed out that the infrastructure was not adequate for refueling ships and trucks – and banks are still struggling to finance such projects. “We have to design this infrastructure with the help of modern instruments for project financing and involving private equity partners,” says Willershausen. The aim is to develop the entire value chain from the producer through the logistics to the end user. The Creon Energy Fund, managed by Creon Capital, is dedicated to this task.